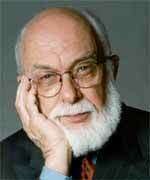 After decades of animosity, skeptic James Randi invited The Babbler to participate in his Amazing Meeting in Las Vegas. Babbler editor Sara Langston said that none of The Babbler’s psychics would attend TAM this year. Randi then mentioned that he knew The Babbler’s original publisher, John Olson. According to Randi, the two met in 1964. Olson then bet Randi $1 that he couldn’t guess what he was drawing on a notepad. According to Randi, Olson then refused to pay Randi, claiming that he really had some kind of power. Randi then promised that any psychic or reporter The Babbler sent to TAM would be safe.